SCOTTISH GOLF "CLUB OF THE YEAR 2016"
According to Peter Alliss it is a 'jewel in the Highlands'. Partly laid out by James Braid, Muir of Ord Golf Club dates from 1875. The course features tight fairways and one of the finest Par 3's in Scotland. A feature is the Inverness to Kyle of Lochalsh and Wick railway line which runs through the course. In years gone bye there was a request stop adjacent to the second tee for persons wishing to play the course. The gate leading to the course from the railway line is still visible. Another feature is the regular sighting of Red Kites which can be seen on most days flying high over the fairways. 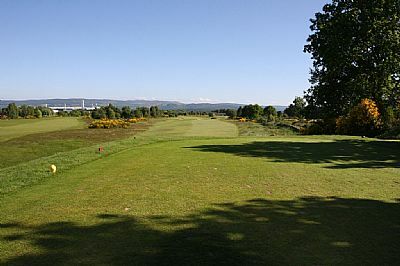 Muir of Ord Golf Course is set in some outstanding scenery with the hills of the Great Glen to the south and the imposing outline of Ben Wyvis visible from all the holes of the course. Muir of Ord Golf Club recently invited Mr James Braid, the famous Walton Heath golf professional to come north and report on the laying out of the proposed extended course at Muir of Ord, funds for which purpose were raised by a bazaar last autumn. Mr Braid arrived on Tuesday and immediately proceeded to survey the present course and the proposed extension. He was accompanied by the officials of the club, viz. Mr J.T. Garrioch, president, Mr D. Forbes, vice-president, Mr Thomas Mackenzie, capt., Mr Thomas Pullar, secretary and Mr J. Fraser, treasurer, and the following members of council, Messrs A. Mackenzie, W. Forbes, A. Fowler, Muir of Ord; and Rutherford and Ross, Beauly. On Tuesday Afternoon and Wednesday forenoon the greens, tees and bunkers were marked off and a full report of what is required to be done will be submitted to a meeting of the club. Mr Braid was very pleased with the ground to be taken in for the extension of the course to the regulation 18 holes. He remarked that the greens which are to be made on the Castle Hill plateau would be very sporting, and generally was favourably impressed with the possibilities of the course and it’s fine situation." Click here to go to the club's website and where a drone video of the entire course may be seen. Suggested activities in the area for non-golfers and to occupy the time between rounds. Glen Ord Distillery : A few minutes from the club and visible from the back nine, Glen Ord offers interesting tours where the whisky making process may be followed. The shop sells the famous Singleton malt whisky - the only place in Britain where it may be bought. Urquhart Castle and Loch Ness : About a 10 mile drive from the club and over a beautiful pass, the castle and the loch make for a memorable excursion. Near the castle is the Loch Ness Exhibition with information on the loch and the famous monster! Rogie Falls : Spectacular falls in deep forest with salmon leaping from July onwards. Glen Affric : Reckoned to be one the most beautiful glens in Scotland complete with a Caledonian Forest and two peaceful lochs. Wildlife of all sorts may be spotted in the area. Chanonry Point : At the end of another Braid course and one of the best locations in Europe for observing dolphins in the wild. The Priory Hotel : Five minutes down the road in the attractive little village of Beauly. Struan Lodge : A two bedroom Canadian style self-catering lodge situated between Muir of Ord and Beauly. North Kessock Hotel : With a waterfront location just ten miles from the golf course overlooking the Beauly Firth and Inverness.